When California officials went out on April 1 this year to measure the amount of snow that had accumulated on mountain slopes over the winter, they were met with bleak scenes of dried, brown grass. The snowpack was so bad — a measly 6 percent of normal — that there was nothing like it in the 120 years of records. 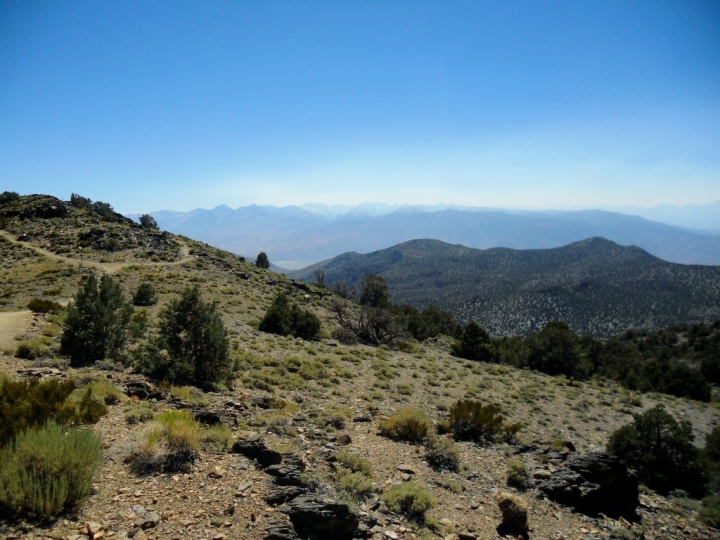 San Joaquin Valley and the Sierra Nevada mountains as seen from the White Mountains. A new study using data from the growth rings of trees in the area finds that this surreal snowpack was even rarer than that: It is “an unprecedented event over the past 500 years,” study author Valerie Trouet, a University of Arizona dendrochronologist, said. 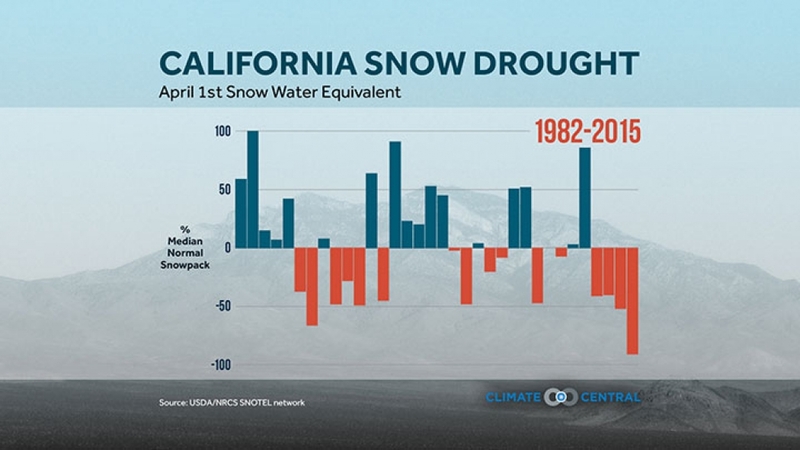 As temperatures in California, like the planet as a whole, continue to rise, such meager snowpacks will happen more often. Increased warmth means more precipitation falls as rain instead of snow and causes what snow there is to melt earlier. This situation can lead to droughts, such as the devastating one plaguing the state now, and that has led to terrible wildfires, like the Valley Fire that is tearing through part of Northern California. And a warmer, less snowy future has major implications for how California, and the West more broadly, manages its water, experts said. “We should be prepared that these [snowpack] levels are going to become more frequent,” Trouet said. California gets the bulk of its precipitation from late fall through early spring. Of particular importance are the snows that fall in the mountains, especially the Sierra Nevada, building up a savings account of water that keeps reservoirs topped up during the warm months. But over the last few years, winter precipitation has been far below normal, sending the state into a deep drought. On top of that, temperatures have been extremely warm — the winter of 2014-2015 was the hottest on record for California — which meant that what precipitation did fall often did so as rain and not snow. High temperatures also meant that any snow that did fall melted very early in the season, leaving only a smattering come spring. When the annual April 1 measurements came in, Trouet and her colleagues were already looking at the historic climate record contained in old tree rings to see how the locations of storm activity had changed in the area over time. The team realized they could take the same approach to put the record-low snowpack in a lengthier historic context, Trouet said. While the threadbare snow cover at winter’s end served to jolt conservation efforts — Gov. Jerry Brown quickly instituted the first statewide water restrictions in California history — it didn’t come as a total surprise to scientists who had been looking into the possible effects of warming in the state. Peter Gleick, president and co-founder of the water policy-focused Pacific Institute, began modeling the potential effects of climate change on California’s water supply 30 years ago, with the results suggesting this kind of event would happen. “It’s shocking in a historical context because we’ve never seen this bad of a snowpack. It was not shocking in the sense that we sort of knew this was coming, and we just didn’t know when,” Gleick said. “This is the new unpleasant reality” for Western water, not just California. Something Gleick’s modeling, as well as the recent work of other scientists has shown, is that temperature is going to play a key role in this future because warming tends to shift precipitation toward rain and cause early snowmelt. And while the precipitation shortages seen this past winter weren’t unprecedented, they happened to occur at the same time as the record-warm temperatures. “The two coinciding was what really made this such an extreme event,” Trouet said. 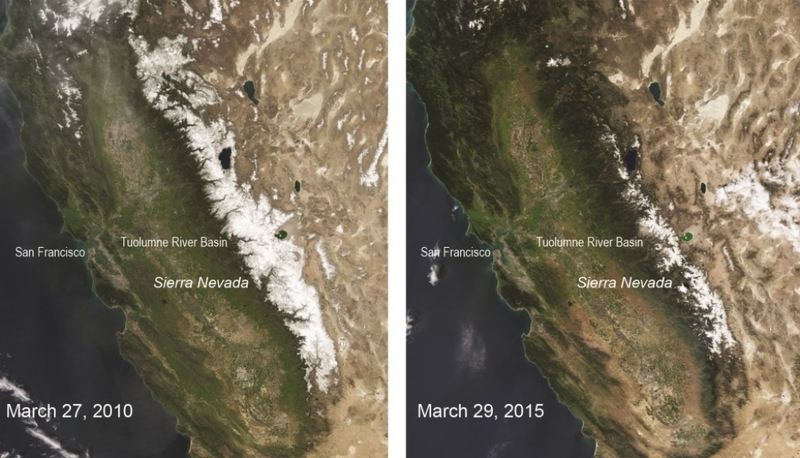 Satellite images show the meager snowpack of 2015 (right) juxtaposed with the robust snows of 2010. It’s unclear what effect warming might have on California’s precipitation patterns, but even if they continue to vary as they have in the past, they will overlap with extreme heat more often as the world warms. There are signs now that this rethinking is beginning to happen, from the individual level to the government level, Williams and Gleick said, but there is concern that if healthy El Niño rains fall this winter, that could cause complacency and set back reform efforts.